Once a poster child for dead and polluted lakes, Lake Erie’s water quality improved in the 1980s as industrial pollution controls and enhanced sewage treatment reduced the influx of contaminants into the lake. However, nonpoint source pollution from urban areas, lawns, and agricultural zones continues to impact the lake’s water quality. In 2014, a combination of factors triggered a toxic algal bloom that fouled water supplies for residents of Toledo, Ohio, and parts of Michigan. In response, officials declared a water advisory and enlisted the National Guard to provide hundreds of cases of bottled water to residents of Northwestern Ohio and Michigan. The 2014 bloom focused national attention on water quality in the Great Lakes and culminated in a $188 million bipartisan funding package to reduce future risks from algal blooms in the region. State and federal lawmakers provided funding to equip cities with resources to upgrade their wastewater infrastructure, fund algae research, and help farmers implement management practices that reduce phosphorous runoff. In addition, the governors of Michigan and Ohio, along with Ontario, signed an agreement in 2015 to halt phosphorous pollution flowing into Lake Erie by 40 percent in the next ten years. Some farmers have also taken matters into their own hands by turning to precision agriculture to more precisely apply fertilizers and pesticides to their fields, while taking care to manage the timing of fertilizer application to decrease the amount of waste that washes into nearby lakes and streams. (Left) Nonpoint source pollution, such as agricultural runoff and microplastics, impacts the health and economy of the Great Lakes region. 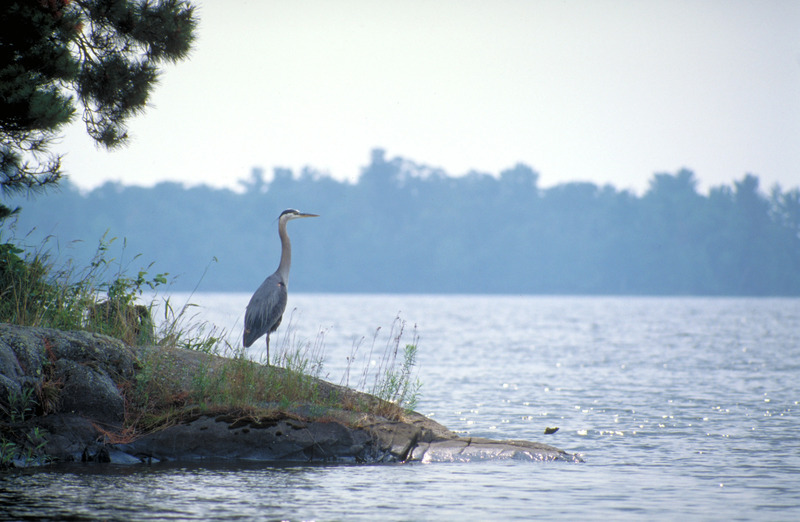 (Right) The health of Great Lakes species such as the Great Blue Heron (Ardea herodias) is threatened by the presence of toxic pollutants in the ecosystem. (Image Credits: left, Lynn Betts; right, U.S. Environmental Protection Agency). However, despite policies and innovation that support best management practices to reduce nonpoint source pollution, one 2015 Ohio State University study found that less snow, heavier rainfalls in the spring, and overall warming temperatures will continue to provide conditions conducive to algae growth. In addition, regulating runoff is particularly difficult. The Clean Water Act regulates the largest farms, such as concentrated animal feeding operations (CAFOs), yet it does not regulate small operations or lawns, golf courses, and other sources of runoff. Beyond agricultural runoff, microplastics, the term for tiny pieces of decomposing bottles, bags, synthetic clothing, diapers, and other plastic trash, make their way into the lakes from nearby rivers and impact Great Lake health. A 2016 study by the U.S. Geological Survey analyzed 107 water samples from 29 Great Lakes tributaries and found evidence of microplastics in every sample. Microplastics cause digestive and reproductive harm to wildlife, including migratory birds and commercially important species of freshwater fish. Continued watershed-level improvements that focus on the full range of nonpoint source pollutants will ensure that the lakes continue to provide important economic benefits: safe drinking water, tourism, recreational fishing, real estate development, and wildlife habitat preservation. According to a U.S. Geological Survey study, small particles of harmful plastics, called microplastics, are prevalent in many rivers that flow into the Great Lakes. (Image Credit: Oregon State University).